Son of the soil Alkesh Saini has brought laurels for the Nation by clinching a silver medal in Table tennis singles at the Asia pacific Masters Games 2018, Malaysia. Saini is representing the Nation in 50+ Table tennis team. The tournament started with qualification rounds in two groups from which 2 players each qualified for the main draw to play the final and the semi final. In an ably fought final match the gold went to Kim Fook Liew of Jerusalem and Juardis Nisban from Indonesia got the bronze. “I am very happy to make my Nation proud, stated Saini from Malaysia. We are hopeful of good results even in the doubles, he added. He informed that the doubles had started from Monday and with Peter Dsouza by his side they pose serious challenge to other competitors. Alkesh and Peter Dsouze, both from Himachal Pradesh have been ace table tennis players to have won various accolades. Together they won the All India Table tennis masters after which they are representing the Nation. Saini has been state champion multiple numbers of times, and now serves the postal department. He has been twice All India postal Champion, and has won various other tournaments at national level. Currently besides being an active player he has also been coaching. He is also the secretary of the local table tennis association. 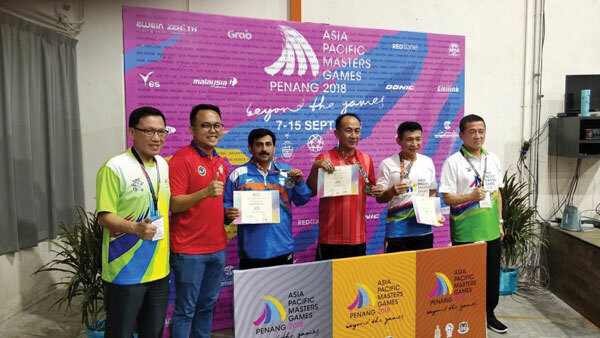 The 1st Asia Pacific Masters Games (APMG) in Penang, Malaysia from 7-15 September 2018 is the first-ever masters multi-sport event in Asia. An estimated 10,000 participants from the Asia Pacific region are participating in nine days of sporting challenge and excitement. It is a fantastic opportunity for those who love sport. The event featuring 21 sports played in one of South East Asia’s top island destination. Athletes compete in their own age group and category – competitive, recreational or social. “True to its tagline “Beyond the Games”, APMG 2018 is more than just a sporting event. It shall be an avenue to foster friendship, goodwill and a chance to propel the growth of master’s sports, especially in the Asian region,” state organizers.